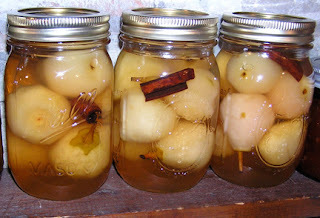 It’s canning season: spiced seckel pears, tangy mid-winter companions to rich meals. October is fast approaching & already the nights are cooler and the prospect of long slow-cooked meals is looking more attractive. This week, boeuf bourguignon... can cassoulet and choucroute garnie be far behind? Our latest book, Sausage: A Global History, is finally out, so we published an article to provide a kind of back-story: “A Vegetarian Unmade,” at Roll Magazine. Regular subscribers to our updates newsletter receive these updates from our blog, Just Served, directly—but there is much more at the blog that isn’t delivered automatically. For example, Dr Sanscravat continued his idle speculations in essays, “We Are What We Ate,” and “Thinking About Lunch.” The blog also welcomed a guest poster: Becky Libourel Diamond, author of the new book The Thousand Dollar Dinner: America’s First Great Cookery Challenge. The Resource Guide for Food Writers, Update #180 is protected by copyright, and is provided at no cost, for your personal use only. It may not be copied or retransmitted unless this notice remains affixed. Any other form of republication—unless with the author’s prior written permission—is strictly prohibited.